The Quint farm in Mitchell County, Kansas was about twelve miles southwest of Beloit and nine miles southeast of Glen Elder. Here in a rock-lined bank house, sometimes referred to as a dugout, Mabel Quint was born on April 21, 1886, the daughter of Louis Franklin and Isabell Flora Jackson Quint. Mother Quint often said it was the most comfortable house she had lived in - warm in winter and cool in summer. The new farmhouse was soon built and here the family lived while Mabel attended school at District No. 76, two miles straight east. Later, the family moved to Graham County, Kansas. An account of the trip by covered wagon will be found in the story of Clarence Delos Quint. When the family first moved to Graham County, the furniture was stored in Hill City awaiting the building of the house in which the family was to live. Mabel and Florence lived in Hill City where the furniture was stored and attended the Hill City school the following school year. Mabel graduated from Hill City common school at the age of 18 and after taking the Teacher's Normal Course received her Third Grade Count Teacher's Certificate No. 31 from Graham County, Kansas dated Sept. 5, 1904. New schools to teach were in great demand as it was the ambition of all the pioneer maids to earn money in this profession. Mabel's father took the buggy, and with the County Superintendent's list of openings, drove a long distance in the Northwest part of the County. Most Board Members wanted experienced teachers. Finally, they found a district that had had an experienced teacher whom they considered lazy, so were willing to try a new graduate. This was the 'Boller school' about twelve miles north of Hill City. They found Mr. Boller out in the cornfield - Mabel wanted $40 per month and was hired at $37.50, out of which the board bill of $3 per week at Boller's must be paid. Mr. Boller was German, and a bit stingy, and since they wouldn't even furnish kindling for the school stove, Mabel pulled sunflowers, stored the long stalks in the tiny ante-room to dry for kindling. The second year, Mr. Hess had taken Bollers place on the school board. He was more liberal and agreed to $45 per month and furnished kindling. Then followed two years at Sunny Slope southeast of Hill City where Mabel boarded with the Bert Morris family, the parents of Veva who later married Elmer Quint. The second year at Sunny Slope, Mabel had a grand basket supper, raising enough money to buy an organ for the school. Mabel loved music and used this organ for many programs put on buy the school. Years later when Florence was teaching Sunny Slope she gave a program and had her younger sister, Hazel, play this organ for the program. Mabel's fifth year of teaching was at Gettysburg School, a new building five miles west of Hill City on the main highway. Her sixth year was Pleasant Home, 3 miles west of Sunny Slope, where she boarded with Mrs. Josie Worland, whose three children were her pupils. The school term closed the last of March and Mabel was married June 1, 1910. Young Dr. Perry A. Loyd graduated in 1909 from Topeka Medical School, which later became a part of the University of Kansas. He established practice at Healy, Kansas in Lane County that summer, purchased a fine sod house for $350, built about 1900. This house had hard plaster wall construction inside, and a fine narrow pine floor. Perry had a 150 foot well and windmill installed. Just before he and Mabel were married, a cyclone tore off the original roof and Perry had a shingle roof put on. After the home wedding on June 1, 1910, they took the train for Salina, changing to the Missouri Pacific there and on to Healy where they established their home in this sod house. While in Salina, Mabel purchased an organ with the $40 given to her by her parents in lieu of a cow, for a wedding gift, and had the organ shipped to their new home. Although I do not remember, Mabel says I had a pig which father had given me and when I knew Mabel was to be married, I asked father to sell the pig for me. When he wanted to know why, I told him I wanted to buy Mabel a wedding gift. He told me he would give me the money for that, so I bought her a 15 cent jelly dish which she still has in the cupboard (1970). Out there in Lane County of Western Kansas, the ranches were large and the houses often miles apart. For most calls, Perry would get a team from the livery stable, sometimes with driver to spell him, but mostly just the rig. One stormy night, he had to drive about 25 miles north to deliver a baby. It happened the doctors had just agreed to make the price for this service $10 instead of $5. The new father was very unhappy about the fee, refused to pay it, and practically threw the doctor off the place. Years later, the girl, who probably knew nothing of this, wanted a birth certificate, wrote Dr. Loyd in Salina. He recalled the circumstance, and obligingly furnished the birth affidavit, still minus the $10. Mabel and Perry made many friends among the good neighbors at Healy, many of these friendships lasting all of their lives. One family, the Arthur Maddens, had a piano, and Nellie and Mabel passed many pleasant hours practicing piano duets. In the fall of 1912 they moved to Culver, Kansas where the country was not so sparsely settled and they felt business would be better. Here he took over Dr. Burney's drug store with office, home and practice for about $2500. 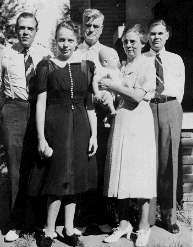 Photo of Herlan, Virgie, Perry, Mable (holding Marlene), Earl Lavon. He could get about fine with his horse, Kit, while Mabel ran the drugstore. He bought his first auto i 1915, a Ford roadster with curtain top. Their two boys were born while living in Culver. The boys did well in school and both became excellent physicians. Perry sold out at Culver in the spring of 1918 and took the family to Chicago where he finished special courses in Eye, Ear and Throat which took tree months. He had decided to open an office in Salina, bought office furniture in Chicago and had it sent to Salina. Returning to Salina, he bought a house on Highland Street, moved his furniture from Culver and prepared to set up practice. However, he had volunteered for service in World War I and was expecting a call any time. Checking with the telegraph office, he found they had somehow failed to deliver his notice to report for duty. He locked his office and joined the medical staff of the Service in August of 1918 as a Lieutenant, serving at Camp Greenleaf, Georgia until just before Christmas. He received his discharge and telegraphed the family he would be home. Herlan, who was then five years old, unbeknownst to his mother knocked on all the front doors in the neighborhood telling them "his daddy was coming home." The first of the year of 1919, Perry opened his office in Salina. They worked hard here, prospered, and Perry was well thought of among his fellow doctors. Their home was the favorite stopping place for all the relatives from far and near, in fact it became almost a small hospital as Perry was forever helping every relative in a professional and most friendly fashion. He was a strong believer in education both for young men and young women, and was always giving help and encouragement to some deserving person. He loved the country and took long drives looking over land he had purchased over the years. Many a farmer who was having a struggle to hold on to his home, received help and encouragement from Dr. Loyd during these times. In November of 1959, the Kansas Medical Society gave a dinner-dance to commemorate Perry's fifty years of medical service. At this reunion, Perry, in his droll way, told a number of incidents from his full life as a great doctor, and had the crowd all laughing.